The 4th Millinery Works – 21st Century Furniture makers show. It is rapidly becoming the major London showcase for bespoke designer-makers and a fabulous place to see the work of contemporary makers next to more historical names like Edward Barnsley, CFA Voysey, Betty Joel, Ambrose Heal, C R Ashbee and many others. It’s no accident that ’21st Century Furniture IV’ exhibition is subtitled the ‘Arts and Crafts Legacy’. The 2013 show includes the work of around 30 of the countries best contemporary furniture makers. We will be exhibiting a number of new pieces. For further information click here for the Millinery Works Website. We are opening our own workshops as we do every year for Dorset Art Weeks / Purbeck Art Weeks. 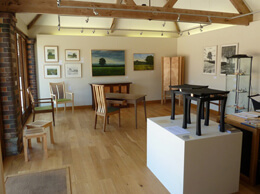 The gallery space will be full of our furniture plus guest artists and makers. It’s always a pleasure to open our own space and talk to visitors. We will be one of dozens of venues open around the Purbecks. There are also other performances and events as part of the festival. More info at Purbeck Art Weeks. A 3 day art and design extravaganza in the heart of Dorset with exhibitions, instillations, room sets, live demos and performances set in the beautiful grounds of the Kingston Maurward Estate, just off the A35 at Dorchester. Not entirely sure what of where we will be exhibiting but we’ll be there somewhere! More in due course on the Dorset Visual Arts website.